A fire which destroyed 40 caravans and damaged another 40 at a park is believed to have been started deliberately. Police and fire crews are still trying to determine the cause but do not believe accelerants were used. Firefighters were called to the storage yard at Ainmoor Grange Caravan Park in Stretton, Derbyshire, at 05:30 GMT on Wednesday. 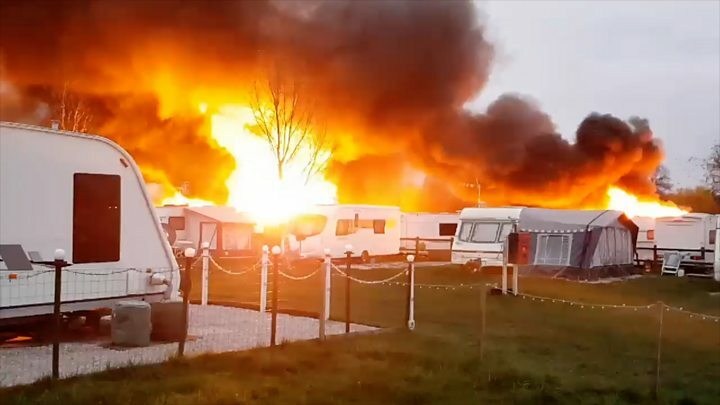 No-one was injured on the site, which houses about 500 caravans. A Derbyshire Police spokeswoman said: "Officers are making further inquiries into the cause of the fire and want to hear from anyone who may have seen anything suspicious in or around the area of Mickley Lane at about 05:00 on Wednesday 27 March." Caravan owner Michael Cheetham said he was "devastated" he had lost items in the fire which reminded him of his dead brother Paul, who died in November. Mr Cheetham, 65, and his brother used to use the caravan when they went to classic car shows together.